The Kosi Raphia Palm is an enormous tree, growing up to 25m tall with leaves up to 18m long – among the largest leaves of any plant on earth. They grow in swamp forests, often forming dense stands. Around the age of 20-30 years the Kosi Palm flowers only once , producing an immense 3m high brown inflorescence at the top of the plant and then, after bearing thousands of fruit that takes two years to mature, dies. 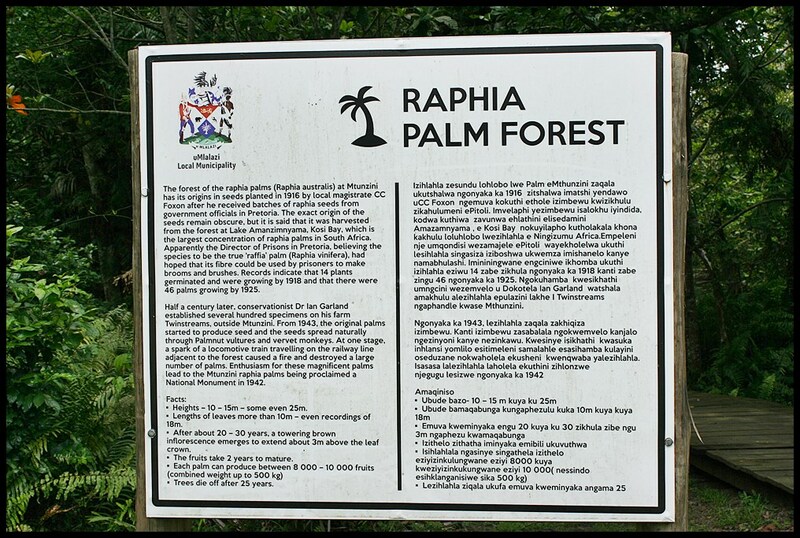 The Raphia Palm family is a main food source for the Palmnut Vulture. Humans use the leaves as thatching material and the petioles to construct huts and fences. This entry was posted in South African Wildlife and tagged Kosi Palm, Mtunzini, nature, outdoors, Raffia Palm, Raphia australis, Raphia Palm, wildlife on February 7, 2019 by de Wets Wild.